Transrectal ultrasound (TRUS)-guided (12–14 core) systematic biopsy of the prostate is the recommended standard for patients with suspicion of prostate cancer (PCa). Advances in imaging have led to the application of magnetic resonance imaging (MRI) for the detection of PCa with subsequent development of software-based co-registration allowing for the integration of MRI with real-time TRUS during prostate biopsy. A number of fusion-guided methods and platforms are now commercially available with common elements in image and analysis and planning. Implementation of fusion-guided prostate biopsy has now been proven to improve the detection of clinically significant PCa in appropriately selected patients. Michael Kongnyuy and Arvin K. George each declare no potential conflicts of interest. 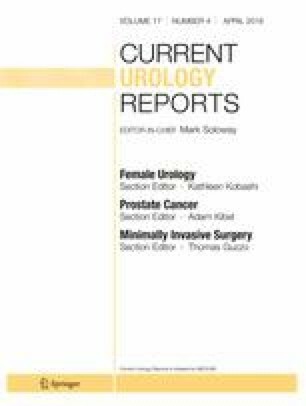 Ardeshir R. Rastinehad is a section editor for Current Urology Reports. Peter A. Pinto reports a patent Method and System for Performing Biopsies issued to No: US 8,447,384 B2, and a patent System and Method for Planning and Performing a Repeat Interventional Procedure pending to File No: US 195-381Úpplication # 2015PF00912.